In the hilly terrains of Phaltan, Satara district, Maharashtra a movement to seed the joy of reading in classrooms is being quietly seeded in 150 Zilla Parishad schools. Pragat Shikshan Sanstha is an educational enterprise that supports schools, teachers and children in the district of Phaltan and other nearby areas. The organisation works with students through their own flagship school and after school programmes, and also trains teachers in good educational practices in government schools. By engaging researchers, government officials and the general public in an ongoing dialogue Pragat Shikshan Sanstha hopes to positively impact the education ecosystem. “We are trying to impact the educational ecosystem by changing the image of ‘the child’ and ‘the teacher’ through excellent classroom practices, sound pedagogies, elements of classroom research and education for equality.” Manjiri Nimbkar, Secretary, Pragat Shikshan Sanstha. One of Pragat Shikshan Sanstha’s areas of focus is setting up more libraries in the region. This, they felt was something that would not only benefit the schools in the area but also children from other nearby communities. The organisation felt that it was imperative to make books and read aloud sessions a part of their training offering to teachers. The idea was to get more teachers to use more books in their classrooms and libraries through read alouds and storytelling sessions. Reading in so important in early childhood as books can free a child, and give them the opportunity to think and imagine. By helping children express themselves in varied ways, books encourage them to understand and empathise with the lives and experiences of those who are marginalised. Pragat Shikshan Sanstha came across StoryWeaver - a digital repository of multilingual stories for children from Pratham Books and in it, discovered a source of stories in Marathi, the language of the region. All content on StoryWeaver is openly licensed under CC-BY4.0 and can be read, translated, downloaded, printed and shared for free. Through StoryWeaver, the organisation has access to many joyful stories in Marathi but without having to heavily invest in buying books regularly. Pragat Shikshan Sanstha curated a list of stories, in different levels across a variety of themes and topics and circulated it amongst the teachers who were being trained in using storytelling as a medium for language development. These teachers also double up as librarians! The teachers choose from the circulated list the stories they think will work best for their students, downloaded them as per their class’s requirement and conduct read aloud sessions. Each library is equipped with a tablet and a projector which the teachers use to project stories off StoryWeaver. They also conduct various activities - art & craft, book reviews, games, skits etc around the books to help extend learning. Pratham Books was fortunate to watch one of these wonderful sessions at a Zilla Parishad schools in the region. 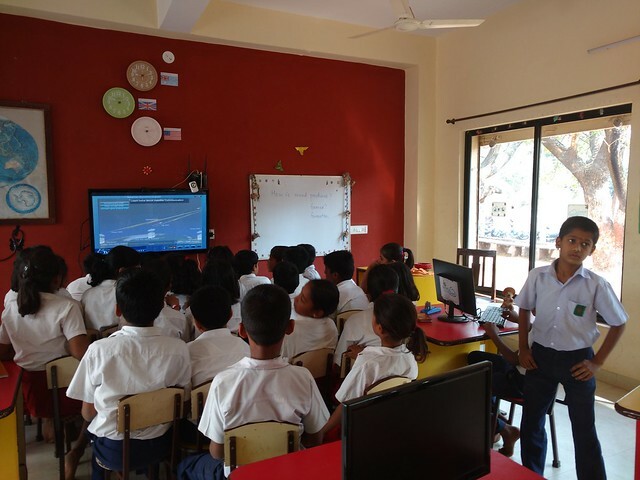 The classroom was equipped with a projector donated by a local badminton association and some computers (in working condition) from a corporate. Bohra Bai, who teaches grades 2 and 3 in the school, first did a little warm up with the children before asking them to sit down. The story she had chosen that day was ‘Sam’s Christmas Present’ by Annie Besant and Alicia D’Souza in Marathi. Bohra Bai started from the cover page and urged the children to note everything that was there on the cover and predict what could the book be about. She got them to make connections, relate it to their own lives and pointed out sight words. Basically, everything you would expect a good teacher to do with a good book. When we took Bohra Bai aside to ask her a few question, young Diksha took over and continued to read the story aloud to her classmates, and did a tremendous job of it! “Storybooks with illustrations help children imagine and understand better, along with learning about new cultures or things they don't see otherwise. For example with this book Sam's Christmas Present, they got to know about the festival of Christmas or the food that is eaten during Christmas as children from villages have never seen or eaten things like that.” shared Bohra Bai. A total of 150 Government schools in the Phaltan district have libraries & digital set up from PSS. About 30000 children from Grades 2 to 7, get to listen, read and enjoy stories in Marathi and Hindi.